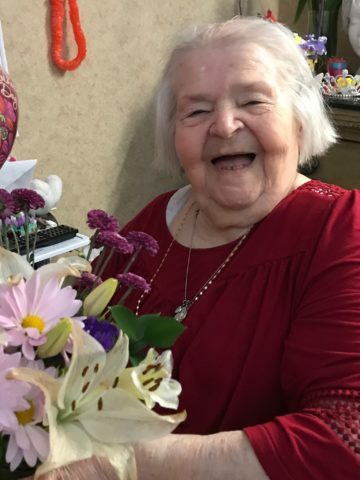 Ailie (Koski) Peach, age 94, passed away on February 10, 2019. Born in Michigan and graduated from Michigan School for the Deaf in Flint, Michigan. Ailie was preceded in death by her husband of 54 years, James William Peach; 2 daughters, Gail Peach Tune and Susan (McGill) Peach; 2 granddaughters, Melissa Kay McGill and Jessica Brooke Pierce; parents, Uuno and Alma Koski; and son-in-law, Ben Frank Sands. She is survived by her son, Mark William Peach; daughters, Judy Sands, Betty Page (Terry), Diane Taylor (Jackie); 12 grandchildren; 23 great-grandchildren; and 1 great great-grandchild. A celebration of life funeral service will be held at 1 p.m. Thursday, February 14th at Harpeth Hills Funeral Home. Interment will follow in the garden of The Last Supper of Harpeth Hills Memorial Gardens. The family will receive friends from 5-8 p.m. Wednesday and from 12 – 1 p.m. Thursday at the funeral home. So sorry for your lost. Prayers for the family. Betty I am so sorry for your loss! Praying for you and your family. Love you. Deepest sympathy to you and your family. Prayers of comfort during this very difficult time. It is easily seen from her picture and bio that Mrs. Peach was (is) a sweet and happy soul, who lived a full and fruitful life. Betty, you and your siblings have my prayers and condolences. May GOD bless you all with good memories. Thank you Steve for your kind remarks. Enjoyed seeing and talking to Peggy at the visitation service. Mrs.Peach was a very sweet lady who I never will forget.It was an honor for me to get to know and take care of her.I know that she is in Heaven no doubt about it!Prayers to all of you and your family! I know you will miss her . Just think of all good time spent with her. her original homemaker was off. I loved her dog it was so cute. Her smile brighten the room She will be truly missed. Prayers for the family. I HAD the priviledge of working with Mrs peach when I worked for metro social services as a Homemaker.She was aSweet Lady.Mrs peach was An Angel Then And A Angel now.Prayers for The Family. Thank you Cathy! The thoughts and prayers are very much appreciated. Thank you for the beautiful Azalea plant! I plan to plant it outside and I am sure we will enjoy it for many years.Mom had a huge pink azalea plant in front of her house for many years.